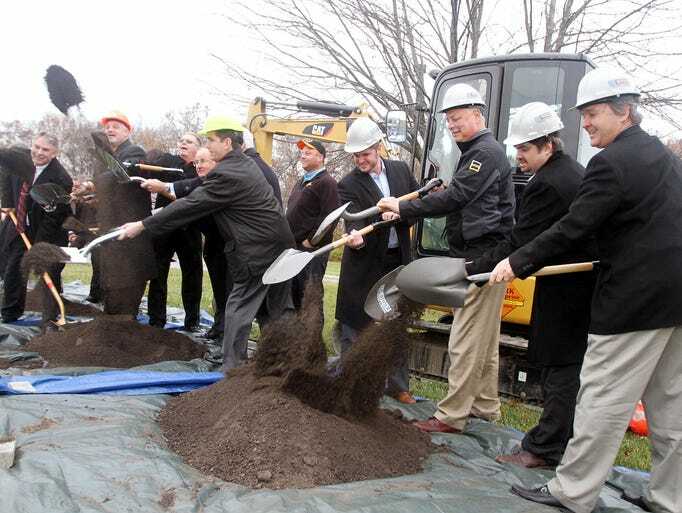 MARION, OHIO – Three projects representing a $23 million investment received their formal groundbreaking Wednesday at the Marion Campus of The Ohio State University and Marion Technical College. 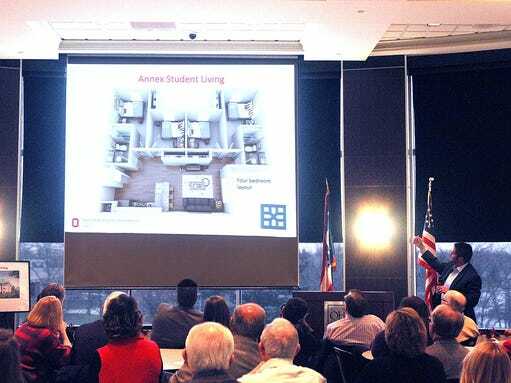 Greg Rose, OSUM dean and director, welcomed about 150 people to the event, which featured a series of presentations about the new science and engineering building, a University Drive extension and privately developed student housing across Mount Vernon Avenue from the campus. OSUM is preparing to hire an architectural firm to do specific design and construction drawings of the $15 million science and engineering building for the regional campus. Rose said he hopes the building will be completed by the fall of 2017. Since the Marion Campus completed a feasibility study for a new science building in 2008, the implementation of several key initiatives reinforced the need for a new science building for biology, chemistry, physics and earth sciences teaching laboratories. Those courses are housed in Morrill Hall in space that does not meet their needs, according to the school. Campus officials also plan to offer a four-year biology degree in the next two to three years, increasing the demand for biology and chemistry lab space. The growing engineering program, which has 200 students and anticipates increasing to 300 in the next few years, and the addition of third- and fourth-year courses in an engineering major also adds to the need for the new building. OSUM will cover at least $12 million of the project cost with internal reserves saved over the years, Rose said. He said he expects the remaining $3 million to be covered by gifts from donors and friends of OSUM. More than $1.3 million of that amount has been raised. Construction of the science and engineering building is important to the regional campus because of the growing importance of the science curriculum in higher education as part of nationwide science, technology, engineering and math initiatives and the increased student interest in science and engineering, he said. Marion County Engineer Brad Irons spoke about the University Drive extension, which has an estimated cost of $2,844,185. OSUM awarded Park Enterprises Construction the contract to build the extension, which has a target completion date of Nov. 1, 2015. “I think it’s a great day for the Marion community,” Irons said of the three projects. The extension has been under discussion since the 1970s, a timeline that was not lost on Jerry Wray, director for the Ohio Department of Transportation, who spoke at the groundbreaking. The approximately $3 million project will be funded by $1 million from the ODOT federal safety fund, which will be used to replace the Ohio 529 curve, while an ODOT enhancement grant will provide about $675,500, and the Ohio Public Works Commission will provide $500,000 in funding. The county transportation budget will cover the approximately $876,300 in remaining expense. The project will extend the existing University Drive, which connects Harding High School to Mount Vernon Avenue where both colleges sit, about 2,900 feet south to Ohio 529. The project will include moving the intersection of Ohio 529 and Marion-Edison Road while making safety improvements to the state route. A $7 million project, the Annex of Marion, as it will be called, will house about 192 students and include a clubhouse. The clubhouse will be the first structure to be built and will contain a model unit as well as meeting space, an industrial kitchen for residents’ use and other amenities. Kyle Bach, president of Mecca Companies/Annex Student Living LLC, which is developing the student housing, said the housing will be built in phases, starting with 100 beds. Rent will be $465 to $500 per bed, with all utilities included. “We’re very excited to be part of the Marion community,” Bach said, adding the company has begun leasing space. Construction is to begin in December. Ashley Irvin, an OSUM junior majoring in integrated English and language arts, said fruition of the three projects is encouraging to students and the community. 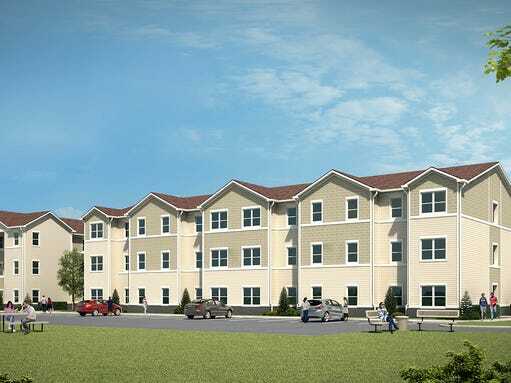 The housing complex will allow students at the primarily commuter campus “to participate more fully in the college experience,” without transferring to the main campus in Columbus. She said the road “will bring a new outlook to our campus” and increase its connection with Marion residents.